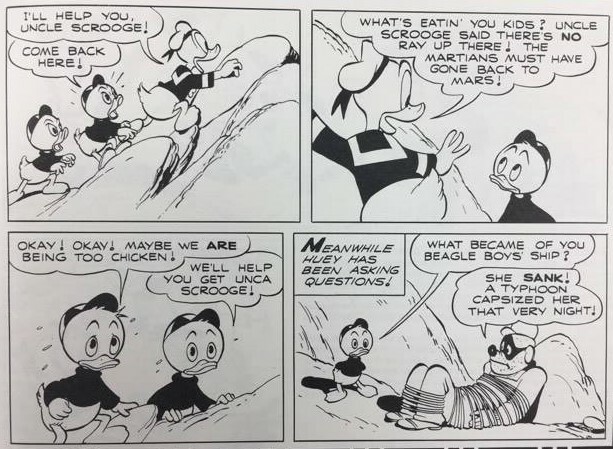 Maybe the best of all survived original pages by Barks. 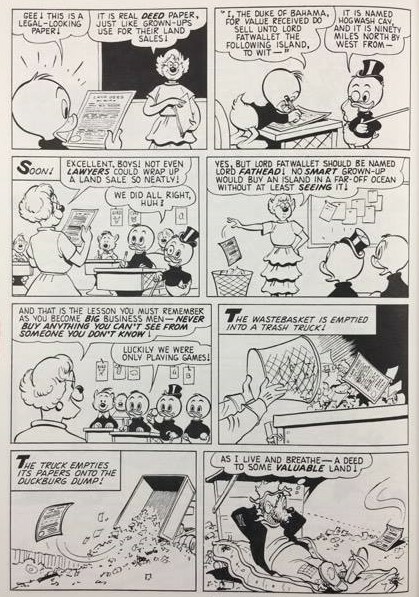 The 12`th page from USFC-456 : "Back To Klondike" from 1953. 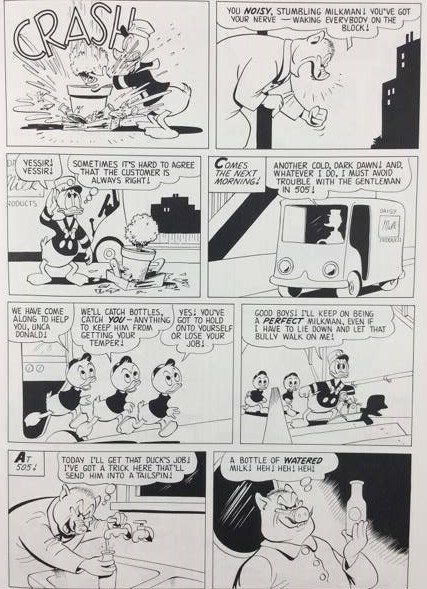 Of the total amount of around 200 survived comic book pages only some 20 % (40 pages) from the 1950`ies has survived. That includes both rejected unpublished artwork (ca. 30 pages) and only 10 published pages. 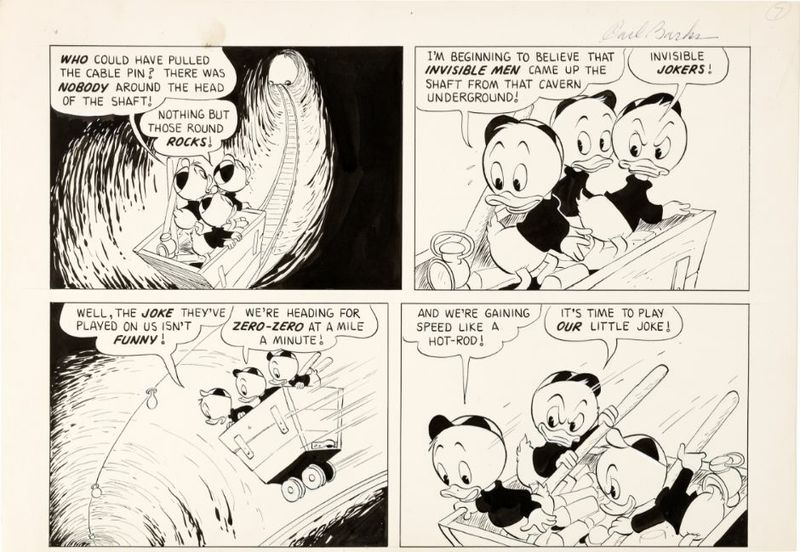 Original unpublished artwork from "The Taffy Story" intended for WDC 175 / 1954. 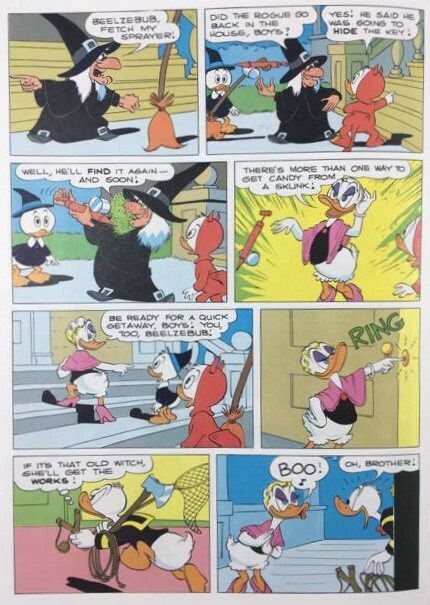 The original 7`th page was scrapped by Barks and has therefore survived. 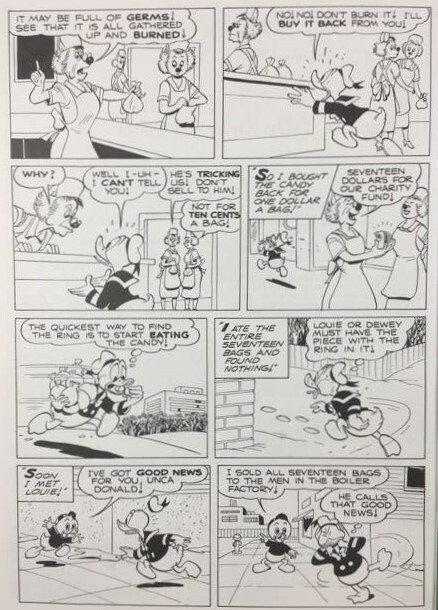 For this story Barks originally made at least 33 ½ pages of artwork but it was reduced to 23 pages. 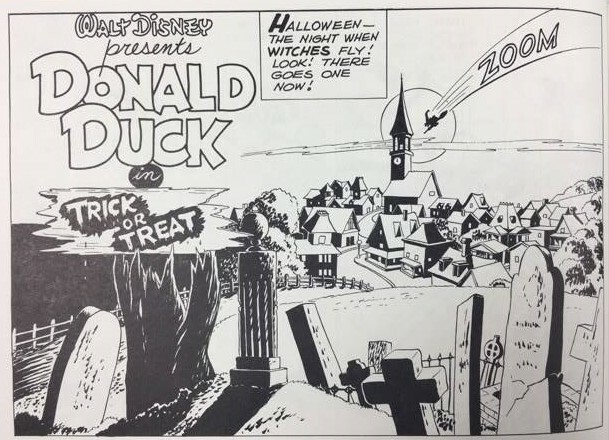 At the same time Donald Duck cartoon of the same title was under process, and Barks had been asked to do a story adaption of it. This is the story with the greatest number of cut-off pages and all the rejected artwork has probably not survived. 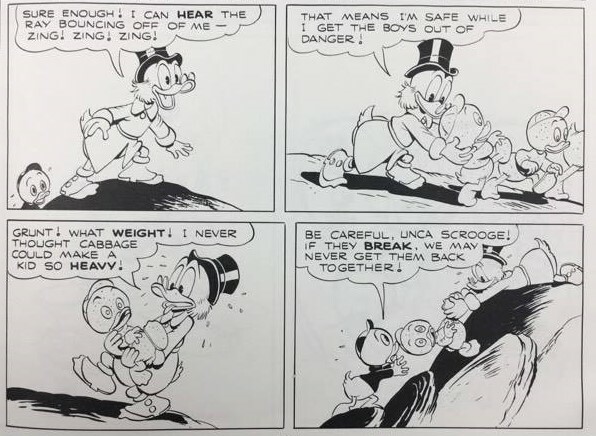 From the story only 10 pages have survived. Probably only the censored art exists today. 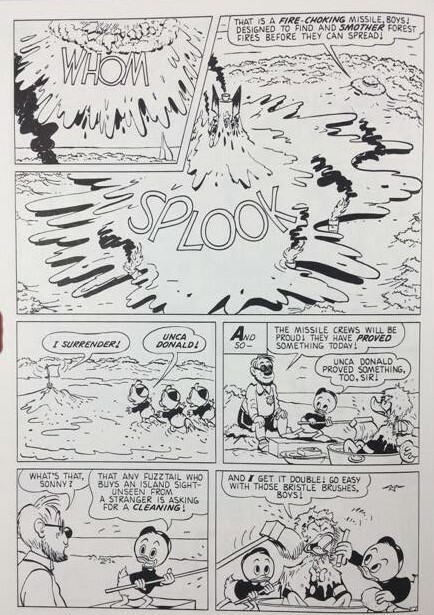 The original splash panel ( First half page ), the original 16th,17th, 18th, 19th, 20th, 21st, 22nd, 23rd and the 24th page and the original upper half of the 28 th page. Unpublished artwork. 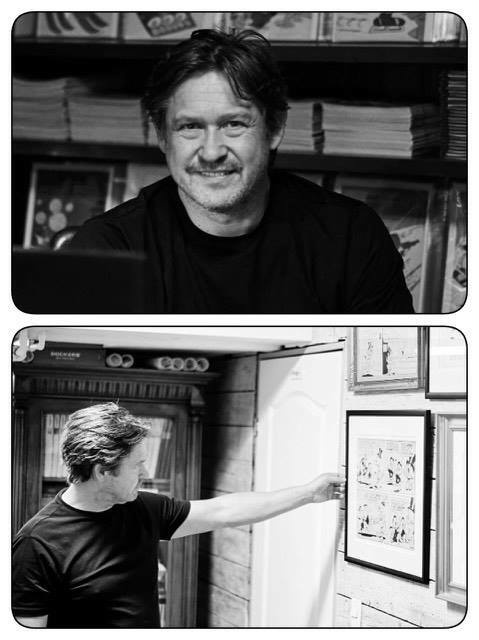 The original artwork are part of private collections. The original artwork is inked in black. The color version shown are from the CBL. 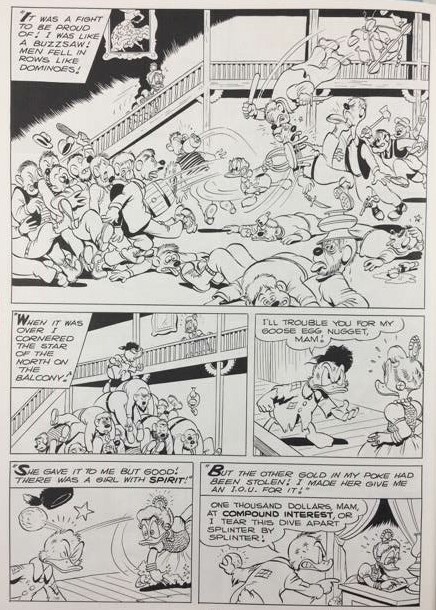 ( Carl Barks Library ). Original artwork. In private collection. 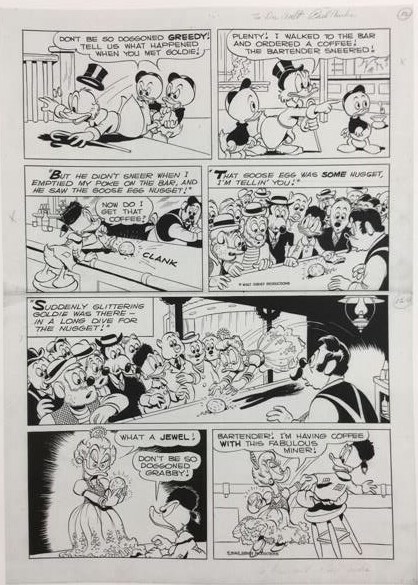 The Upper Half page was sold on Heritage Auctions in November, 19 - 2010 for 11.980 $. 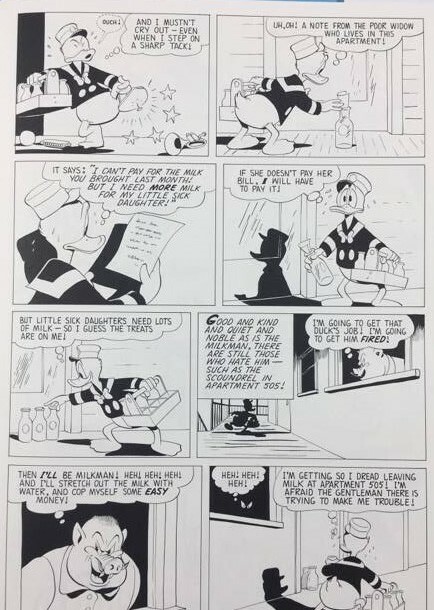 It was sold again on Heritage Auctions in August, 5 - 2016 for 17.925 $. The 17`th page was for sale at Galerie Laqua in 2003 for 27.000 $. And again for sale at Galerie Laqua in 2004 for 27.240 $. 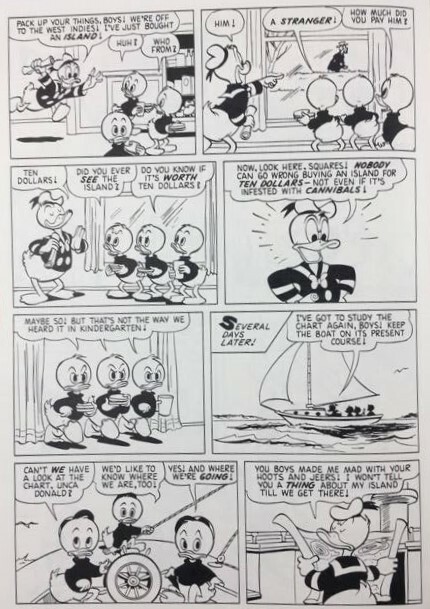 The 21`st page was sold on Heritage Auctions on November, 20 - 2015 for 35.850 $. 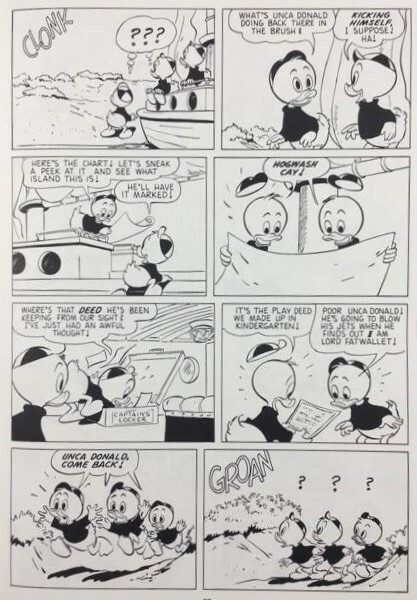 Barks originally drew this as a 32-pager story, but it was reduced to 27 pages. From the rejected five pages four and half pages have survived. The last half page has vanished. 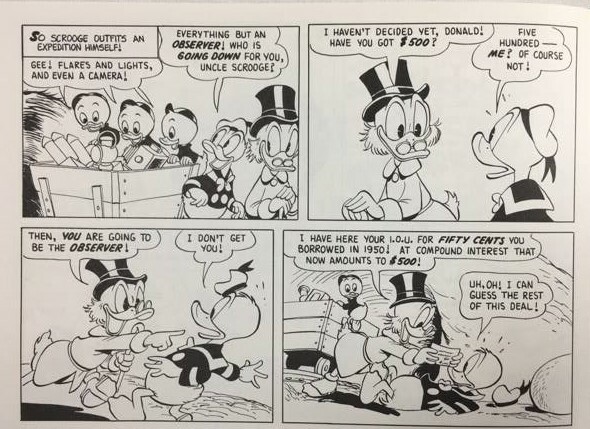 In the book ”Uncle Scrooge, His Life and Times” there is a sketch for the missing half page. 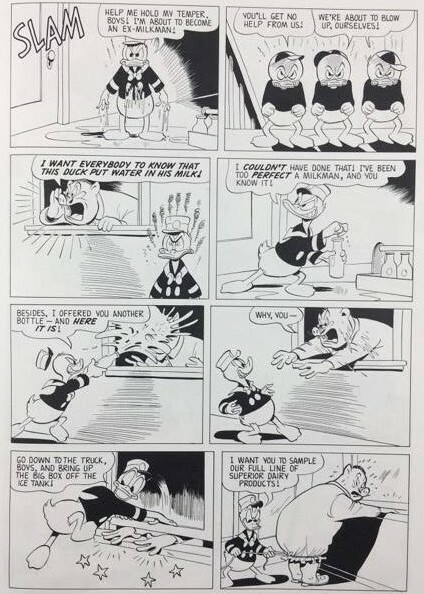 The original 12th, 13th, 14th, 15th page and the lower half page of the 20th page. USFC 456 - Page 20 lower half. 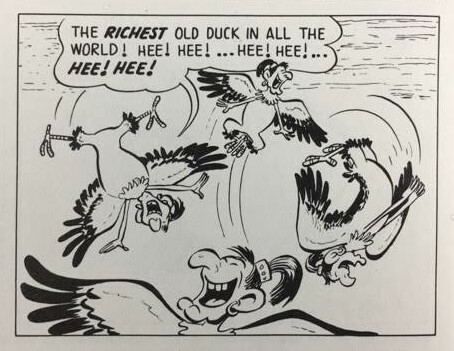 WDC 157 - "Old Demon Tooth"
Oct. 1953 ( Jan. 1953 ) Only one panel has survived. The panel was planned to be the 7`th panel of the 10`th page. The artwork was rejected by Carl himself. 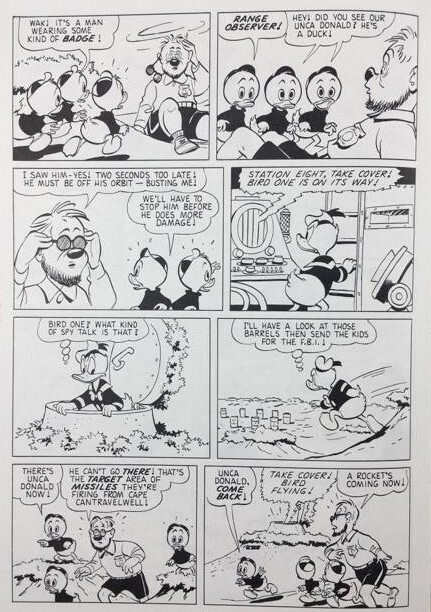 He later commented : "I believe I recall looking at the panel of Uncle Scrooge's money ramp and decided it looked too impossible to be real". USFC - 495 - Sept. 1953 ( Febr. 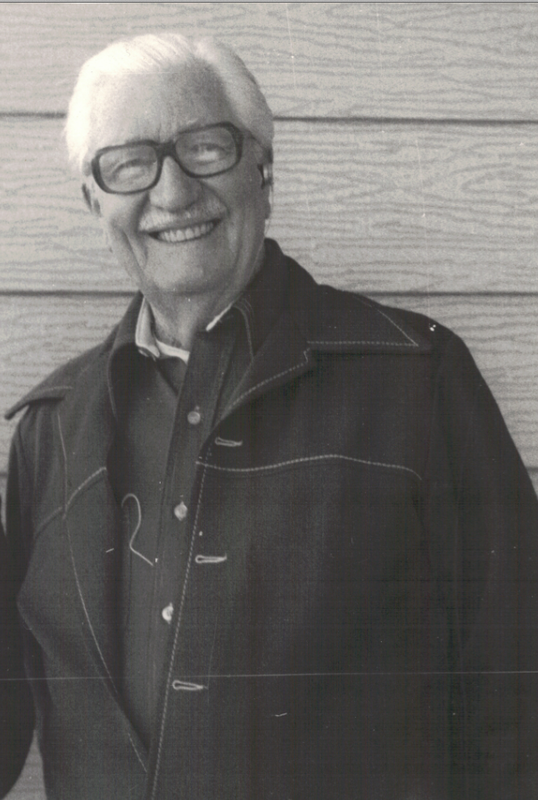 1953 ). One half page has survived from this story. 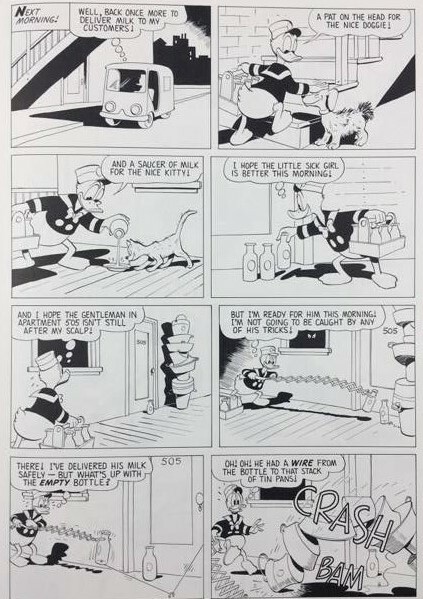 Barks rejected the artwork which was planned as the upper half of the 9`th page.However, the art is numbered as the upper tenth page. So there was more cut art from the story when Barks tightened it. 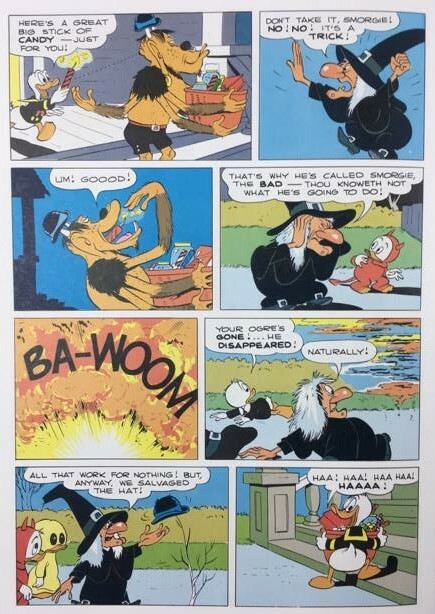 This half page Barks saved himself and no other pieces of art from this story exist. 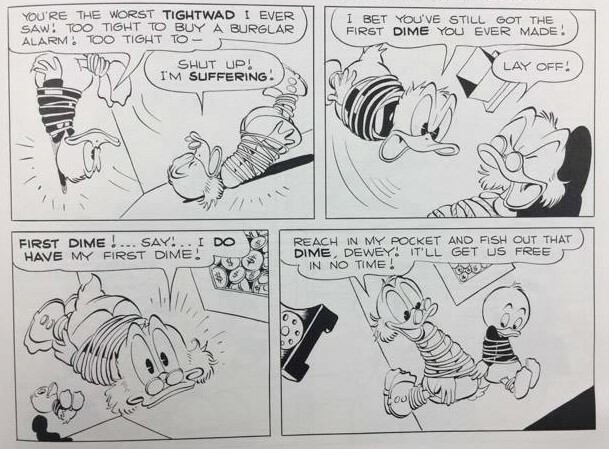 Scrooge`s ”Old Number One Dime” appears for the first timein this story. Unpublished artwork. USFC 495 - Original artwork. The half page was for sale at Galerie Laqua in 1997 for 10.500 $. The half page was for sale again at Galerie Laqua in 2003 for 15.700 $. In private collection - Germany. Barks himself edited this 32-page story down to 28 pages. 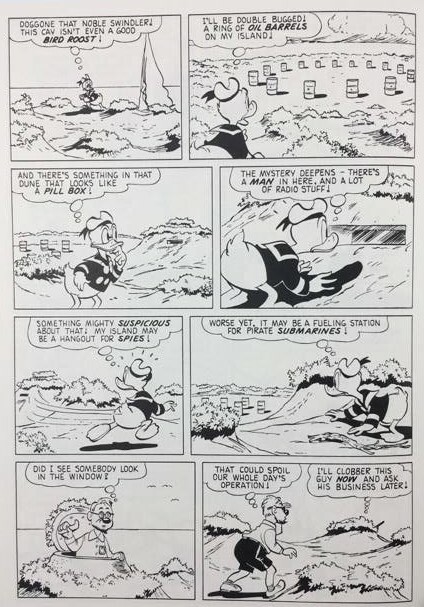 Normally, he did these cuts already before inking but in this case there exists only one and half page of the cut-off story. Barks kept the art until he sold them to collectors. 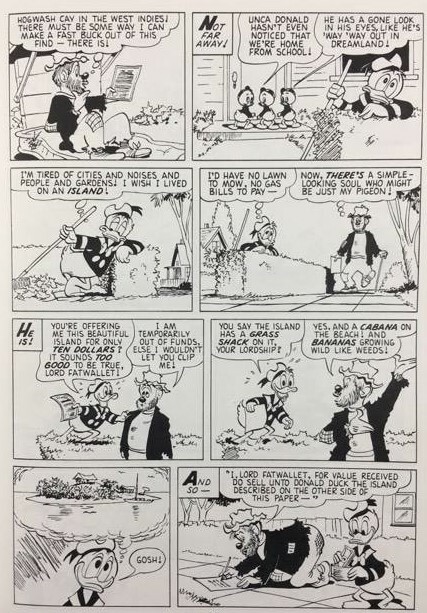 Kim Weston writes in his article that ”I feel reasonably sure that up to three more full pages from this story exist or did exist and were probably given away to fans by Barks many years ago”. 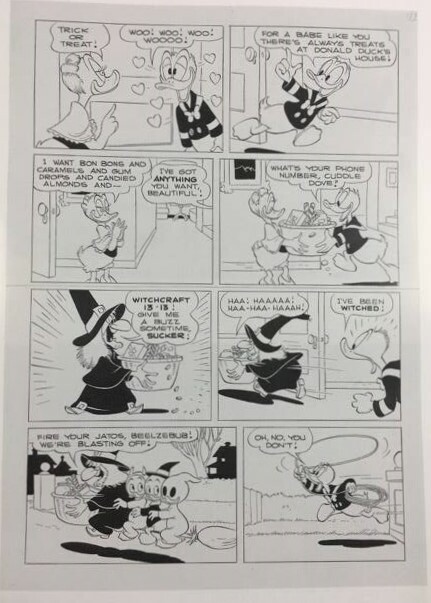 There are two unfinished ( only solid black areas are not inked ) quarter pages which were rejected from the 13th page.The page number is also marked on them. 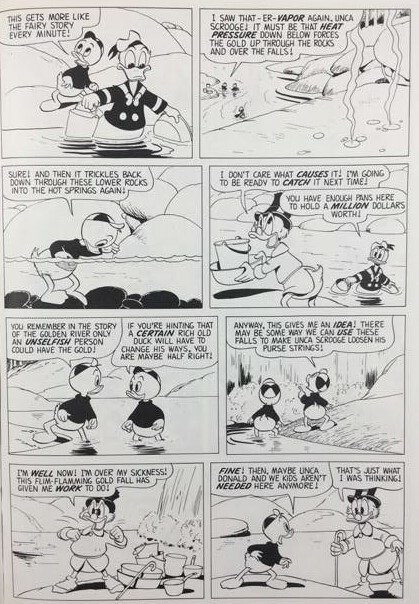 Probably Barks planned to use the art in the second and third line of the page and the published second line was planned to be after them. Unpublished artwork. The upper half page 16 has found it`s home in Denmark. US 8 - "The Mysterious unfinished Invention"
Rejected artwork planned for the top of the 16`th page. Rejected artwork planned for the bottom of the 17`th page. From this story only one page and two panels have survived. Barks tightened the story by two and half pages – but only a half of them has survived. 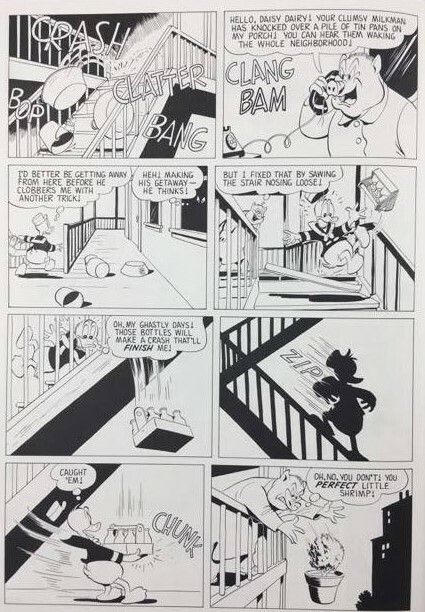 The rejected pages seem to belong between the published 6th and 7th page showing the two episodes in a hospital and in a factory. 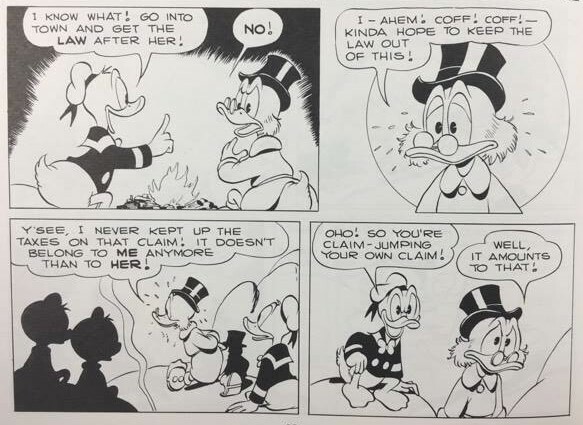 The two final panels of the planned 6th page survived. Thehospital episode still exists. It was originally the 7th page. 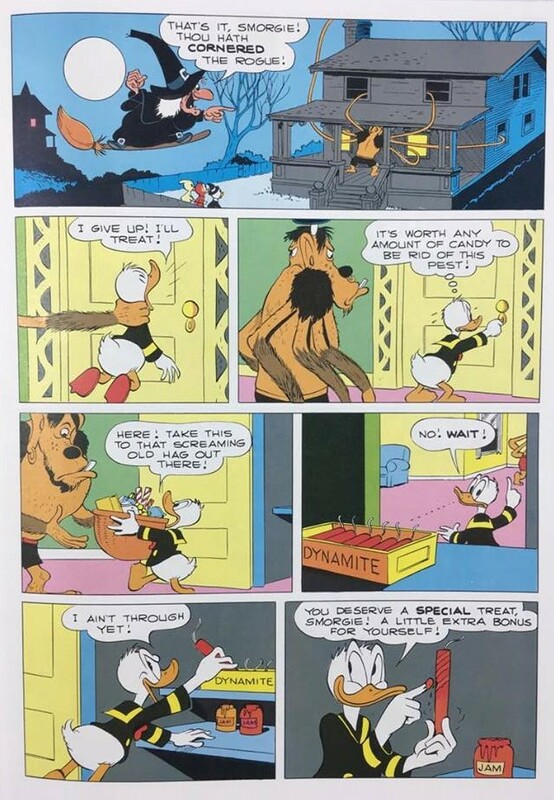 The factory episode ( 8th panel ). 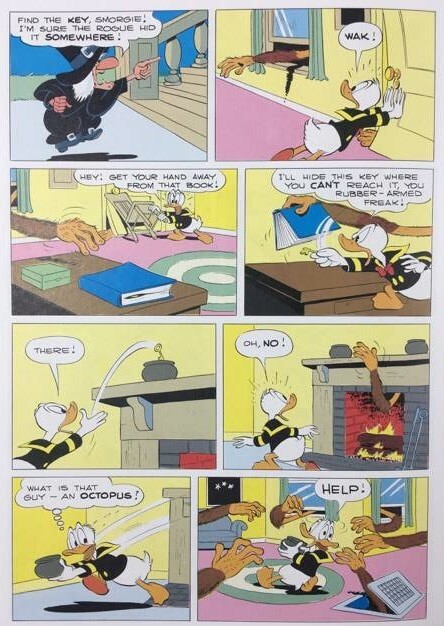 As well as two panels from the 6th page, have vanished. 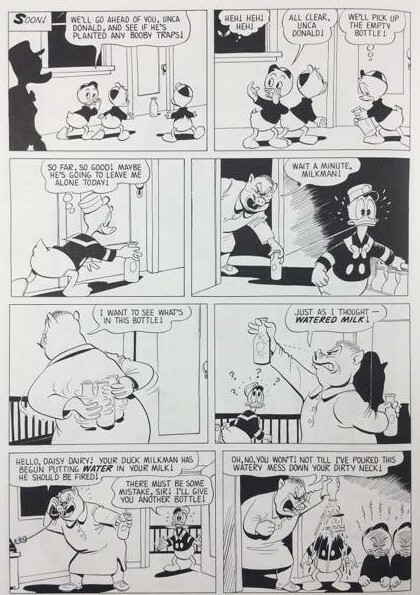 Barks : ”My reason for scrapping this sequence of business with the nurses and replacing it with the bear pit was that the nurse business was not funny and it could not be understood by a person who couldn`t read the dialogue. Unpublished artwork. The original artwork are in private collections. Rejected artwork planned for the two final panels for the 6`th page. Survived artwork - yes ! - but does the final 2 panels still exists..? 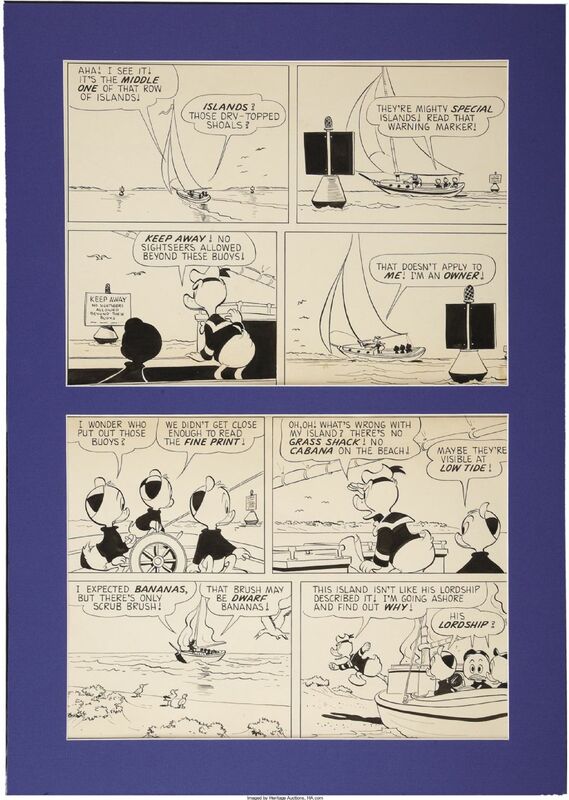 The 7`th page was sold on Heritage Auctions in May, 22 - 2009 for 13.145 $. 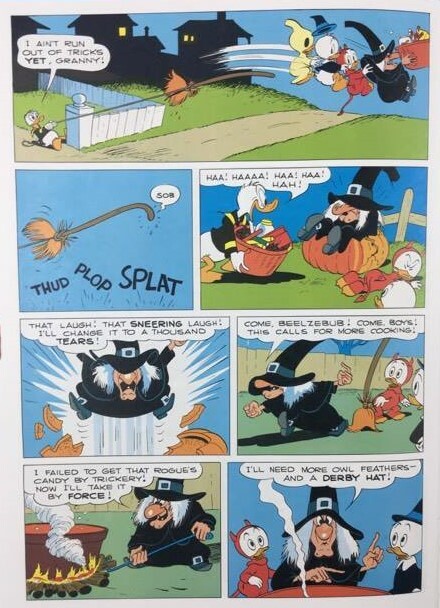 Rejected artwork of the original 7`th page. From this story have 3/8 pages survived. They are one large and one normal size panel. The rejected art are the 1st and the 3rd panel of the 16th page. 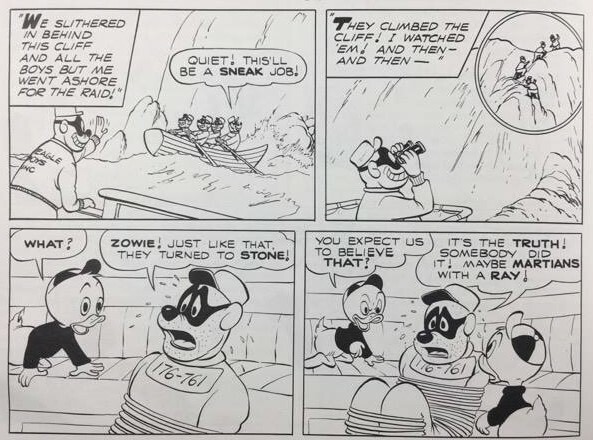 The publisher wanted Barks to redraw a page or two but only these panels seem to be in existence from this 32 pages long story. Unpublished artwork. 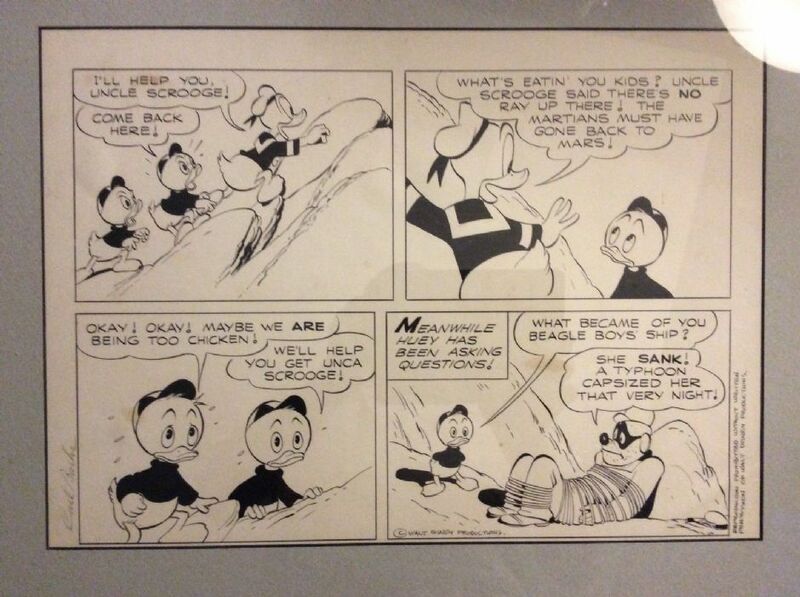 The original art are in private collections. 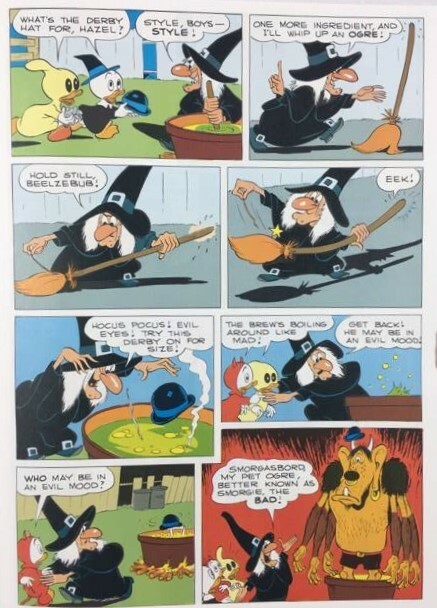 US 12 - "Golden Fleecing"
Rejected artwork planned as the 1`st panel of page 16. 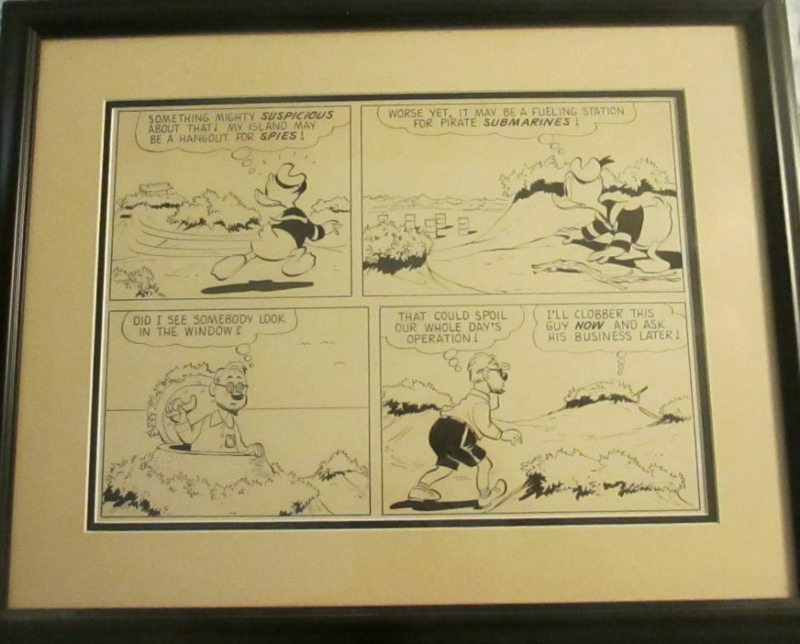 Original artwork planned as the 3`rd panel of page 16. 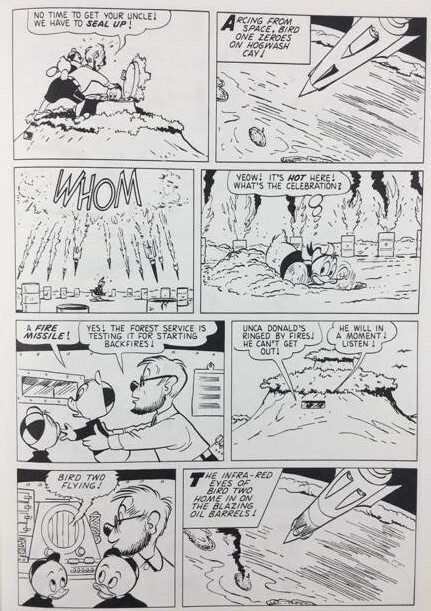 10th page except the 1st panel, two first panels of the 11thpage and two rejected panels of the published page 21. Survived rejected artwork intended for US-13. Original the upper half of the 4`th page. 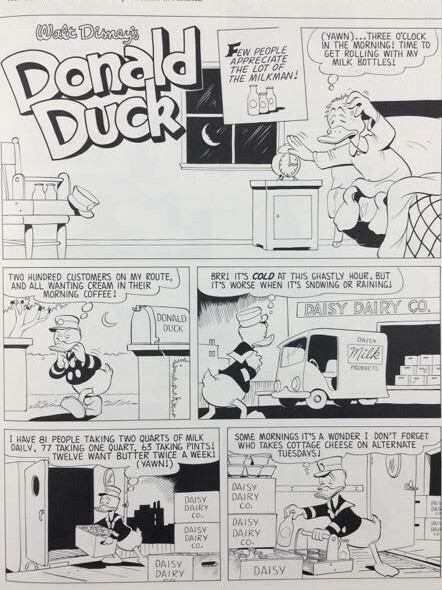 Half page of the original 6`th page. 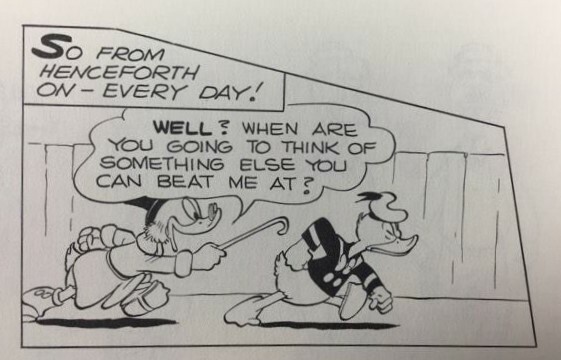 The first 2 panels of the 10`th page has survived. The rejected 2`nd and 3`rd panel from page 21. The whole 10-pages long story has survived. Western Publishing rejected it and it is not clear in which WDC number it should have been published. In those times the ppublisher did not publish Barks`works in the order he drew them. 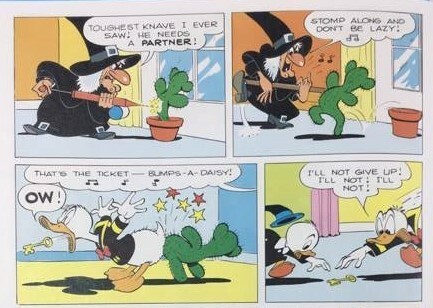 According to Barks the story was rejected ”because Donald was too mean to the villain”. 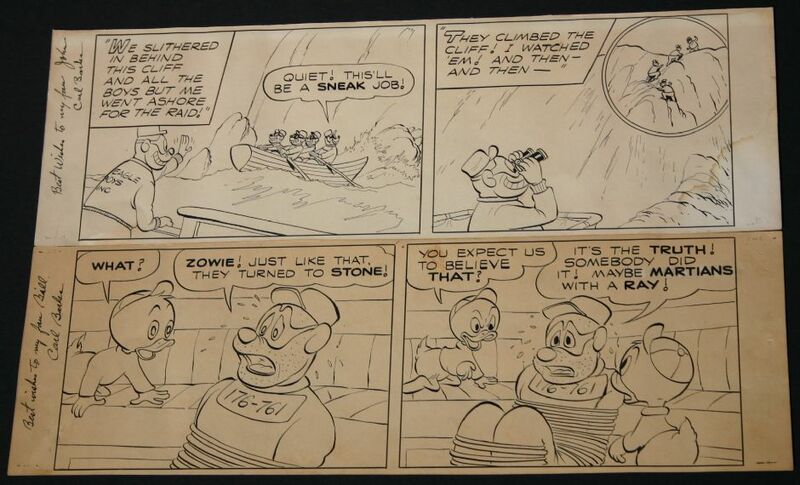 The original art for most of the story now resides in the Walt Disney Archives. 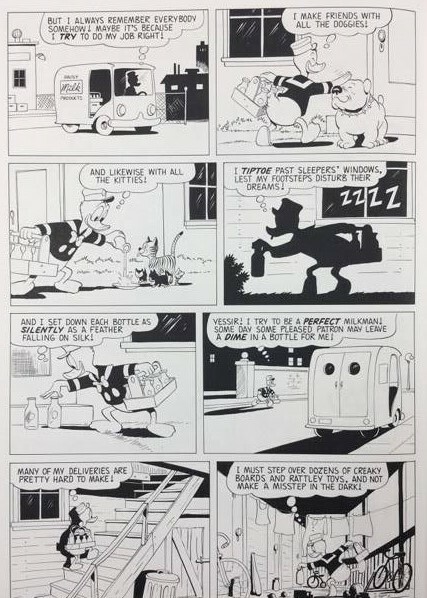 But not all - …a friend of mine made photostats of the complete ”Milkman” story while all the original artwork was still in the Western Publishing`s offices in Los Angeles, but some of the artwotk was later stolen. Presumably the missing artwork still exists. 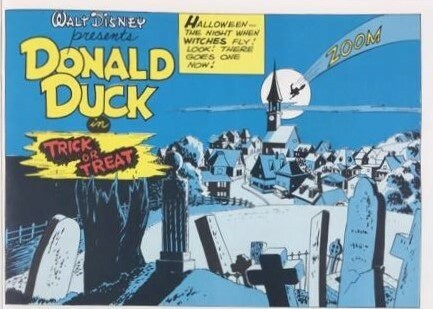 Unpublished artwork.The original artwork are in The Walt Disney archives and some is missing. From this story nine panels have survived. Barks rejected them to get more action and gags. 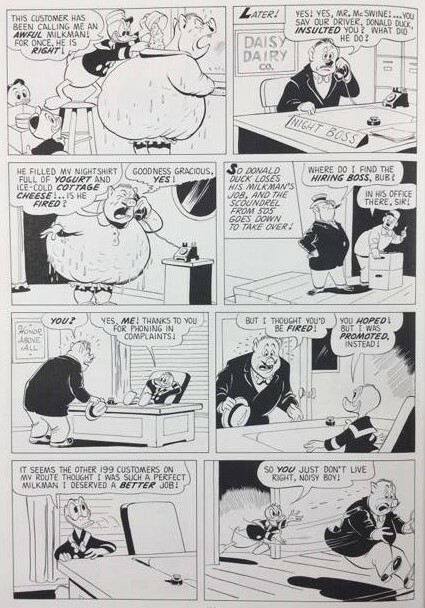 He added one page of gags after the upper half of the 4th page. 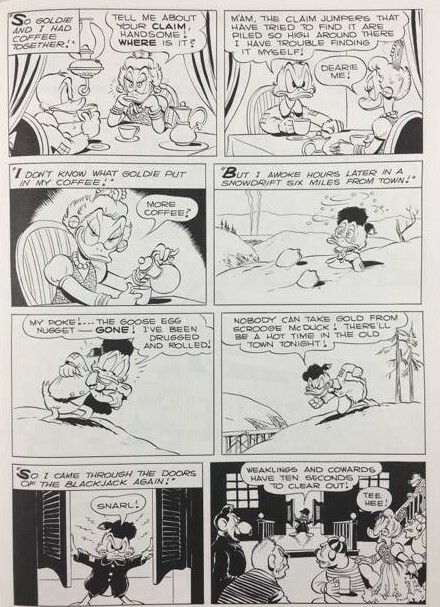 Barks added this gag page after the story had been completed. So, he cut nine panels and replaced them with one panel, to get space for this gag page. 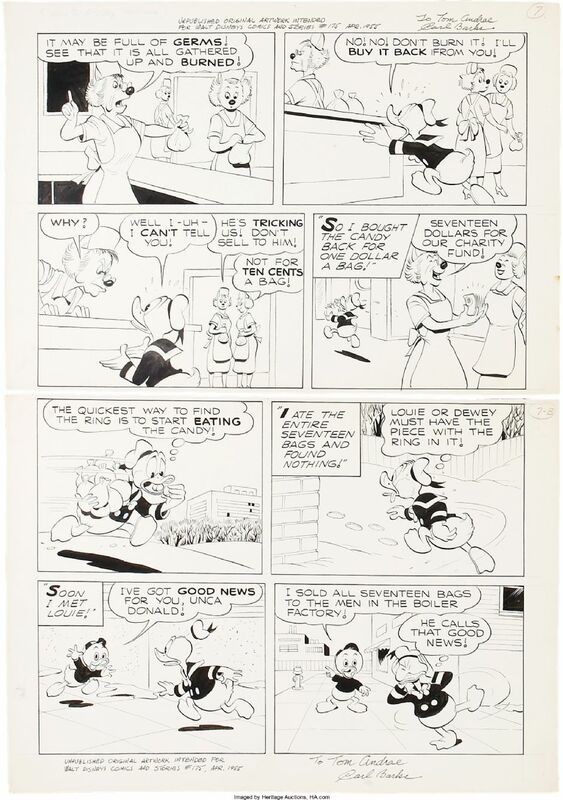 The surviving art includes the original upper half, the 6`th, 7`th and 8`th panel of the 16`th page and the two first panels of the original 17`th page. Unpublished artwork.The artwork is in private collection. Survived rejected artwork intended for US-22. 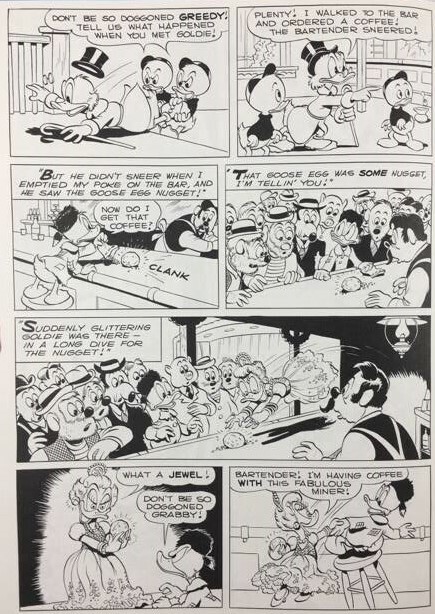 The original upper half, the 6`th, 7`th and 8`th panel of the page 16. 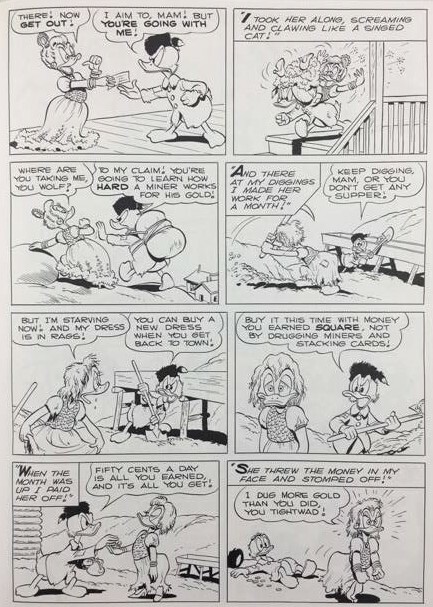 The two first panels of the page 17. 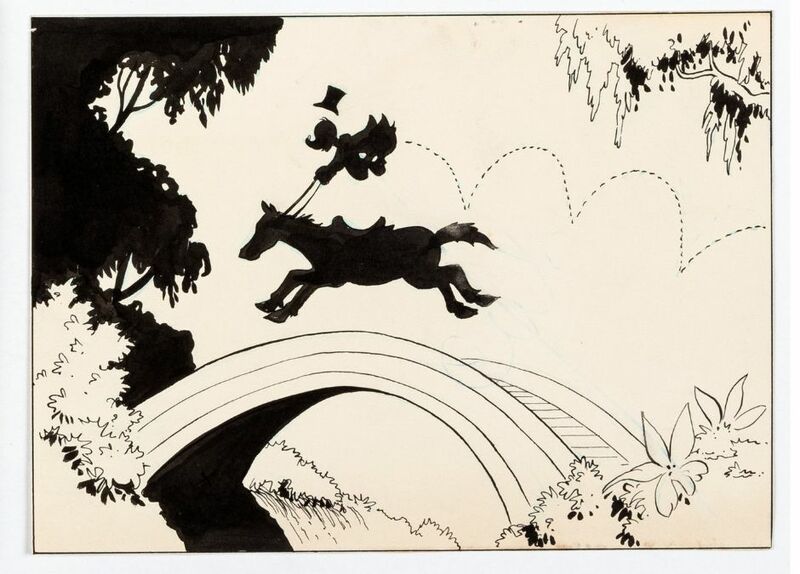 US - 22 "Horseback Riding"
One unpublished panel has survived from this story. "Want to Buy an Island ?" The whole 10-pages-long story has survived. It is the only non-censored artwork which has survived from the 1950`ies. The 5`th page was sold on Heritage Auction on May, 23 - 2008 for 10.157 $. 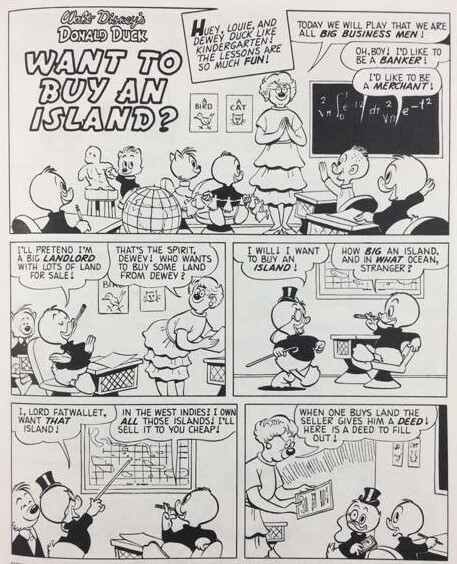 "Want to Buy an Island ?" page 6 - ATTENTION : PARTLY STOLEN ARTWORK !! 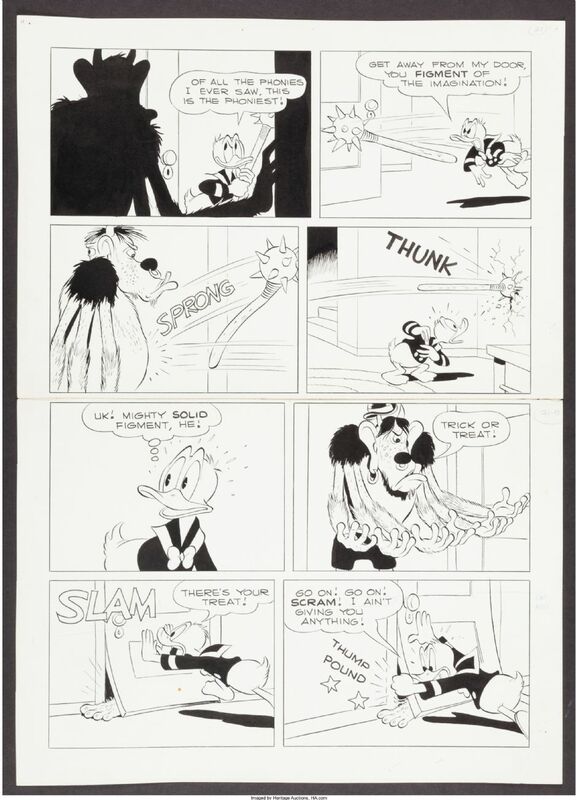 The Upper Half page was stolen in 1995 during an exhibition in Oberhausen, Germany. Every indication to solve this case is welcome. 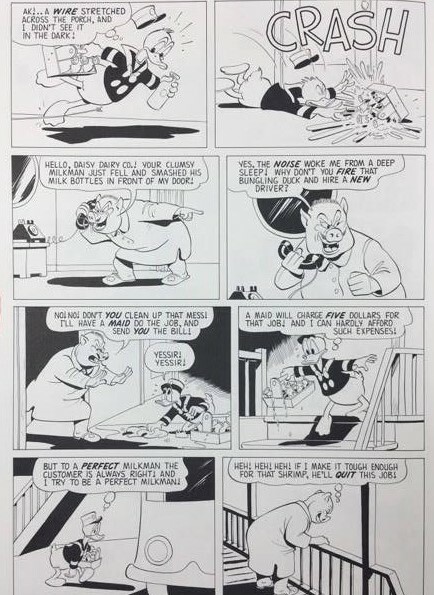 This is the original artwork of the lower half page 6. The artwork was bought in 1997 for 3.500 Usd.